Anyone can do digital scrapbooking! I use Adobe Photoshop Elements 7.0 right now. You can get it online or at Costco. Sometimes they have deals, I got mine for $40, but then think how much you spend on paper supplies! 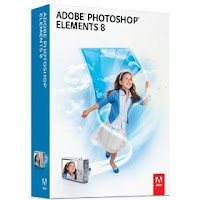 They have version 8 out now, its $80 at Adobe‘s website, and now version 7.0 is on sale, check out this link! And there are TONS of resources to help you learn online as well. Lots of free tutorials and even free scrapbooking embellishments and paper etc. Do a google search on ‘photoshop elements scrapbooking tutorials’ or ‘free digital scrapbooking elements’, check out ikeagoddess.blogspot.com/ and you’ll get lots of freebie links. Also on www.jessicasprague.com she offers EXCELLENT free tutorials too and some paid classes that are WORTH THE COST! There are some at scrapgirls too. Its really easy and no mess to clean up LOL! Yes, I use Photoshop Elements to make my school downloads as well. I also use Microsoft Publisher, but mostly to make the PDF files because for some reason if I make a PDF straight out of photoshop the file is WAY bigger than if I make it out of publisher…haven’t figured that one out yet! But photoshop is MUCH better for graphic work than Publisher. And worth the price. Don’t get sucked into all the cheaper scrapbooking softwares out there, they aren’t worth it! You can email me at erica at confessionsofahomeschooler dot com and I’d be happy to help you out more! MOM: It's really easy, there are a ton of online tutorials you can find for free, and like I said in this post, visit Jessica Sprague's site, she'll get you going!I print at home or through Costco, there is also online printing like scrapbooksplease.com but you have to get their luster paper which is more expensive or the prints don't look very good. Found you today looking for home school stuff for my preschooler. Then saw your digi link. Ironically I own a digital scrapbooking site. Your kits are cute. Wanted to say that Jen & Stan are great at http://www.scrappersworkshop.com for some beginners or advanced classes.